Another day, another brotherly scuffle. 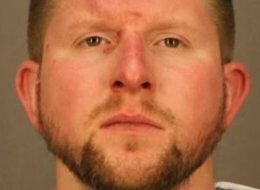 According to Huffington Post (http://m.huffpost.com/us/entry/4722926) and an article in the Democrat and Chronicle of Rochester, police say that 27-year-old Sean Fallon-Nebbia, pictured above, ending up biting part of his brother’s ear off, punching him several times in the face, and knocking him out just to make sure he got the message. But what started this brotherly brouhaha at the Super Bowl Party Fallon-Nebbia hosted? Sure, they drank a whole bottle of whiskey before the incident, but I’m guessing that is not unusual. Based on a trend I’m are seeing, it was not about the outcome of the game, or whether Peyton Manning is still the man, it was something about the food (http://wp.me/p3lORd-3U). Lord knows that people are passionate about their food. Were the chips stale? Not enough bean burrito dip to go around? Was it an issue that the pigs-in-a-blanket weren’t gluten free? This entry was posted in Uncategorized and tagged #amwriting, #arrest, #book, #chipsanddip, #contest, #crazy, #dysfunctional, #family, #fight, #food, #game, #jail, #party, #Peyton, #SuperBowl, #trial, #writing by thebufferzoneday. Bookmark the permalink. Another one? This type of rivalry seems to happening a lot lately. It’s definitely something in the food, or not enough food in which case brings on the chowing down of someone’s ears. It’s all a bit disturbing. Speaking of disturbing things, ears, and food, there is a nice restaurant in Cincinnati, The Montgomery Inn Boathouse, that is famous for it’s ribs. It has a beautiful view of the Ohio River, and is decorated with an abundance of sports memorabilia. What is disturbing about that? In a prominent glass display case there is the piece of Evander Holyfield’s ear that Mike Tyson bit off in their boxing match in June, of 1997. I always avert my eyes when we pass, otherwise I wouldn’t be able to eat an otherwise enjoyable meal there! Nasty! It sounds like a very nice place for a meal. However, if I had someone’s bitten off ear ‘looking’ at me, there’s no way I could eat. I would have to request a table far away from that ear. Maybe it was the, “Your mother looks like a linebacker.” comment, the irony of which would likely have been lost on the two of them. It seems more and more of my WP friends see this SB thing in this not so flattering light. The people at the SB party I attended were divided between the two teams so half were mad and half were happy but everyone was worked up. Next year, I will watch Downton Abbey reruns instead. Maybe it was the food, after all! I think we are on to something here Beth. I’m going to start investigating conspiracy theories, after I finish watching the last episode of Downton on my DVR. I would argue PB&J sandwiches aren’t good even if someone doesn’t lose an ear (yuk!) but hey, what do I know. I didn’t watch the Super Bowl – maybe this is related to some peanut butter commercial that was sung in Arabic or something…?